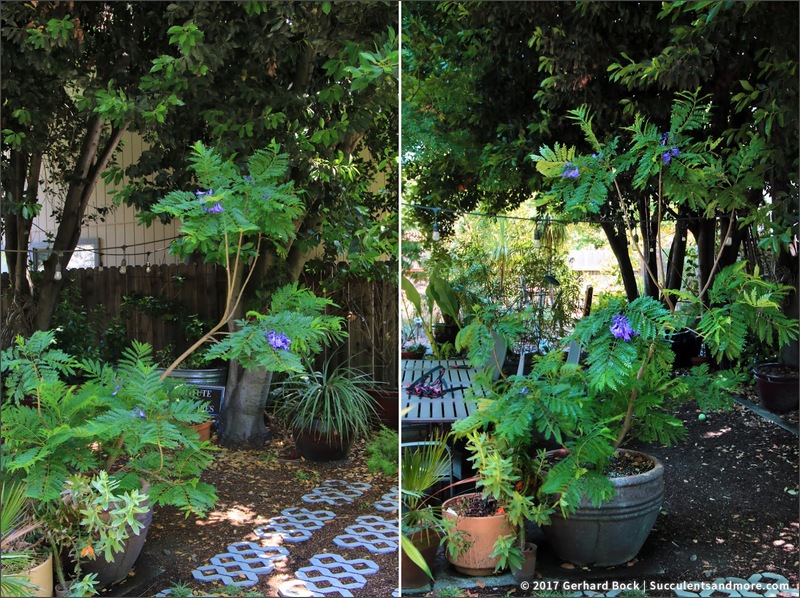 Two years ago, in June 2015, I bought a dwarf jacaranda sold by Monrovia under the name 'Bonsai Blue' and I planted it in large concrete container on our back patio. Click here to read my original post. 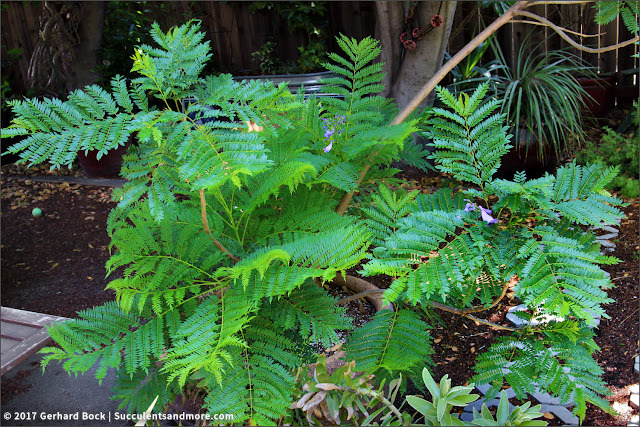 A lot of people have asked me how that jacaranda has fared. Time for an update! 'Bonsai Blue' is very much alive. In fact, it's blooming for the first time ever! I'm very excited because I wasn't sure it was ever going to flower, seeing how it receives only a few hours of direct sun. In full sun, I imagine it would be covered with flowers, just like a regular full-size Jacaranda mimosifolia. Bottomline: I'm happy with my 'Bonsai Blue' and will continue to give it good care. 1. First and foremost, I should have been more proactive about pruning (yeah, what else is new?). As you can see in the first photo, there's one dominant leader that sticks out far above the rest of the branches. I shouldn't have let that happen. In fact, I'm tempted to remove the leader altogether so all that's left is the lower foliage. I think a bushier look be more appropriate than what I have now. 2. 'Bonsai Blue' (I imagine like all jacarandas) really doesn't like high winds in the winter. Last December, it looked like it would make it without loosing any leaves. Then came a series of wind storms that completely defoliated it. It took until March for new leaves to grow. 3. 'Bonsai Blue' grows quickly as soon as daytime temperatures stay in the 70s or above. 4. 'Bonsai Blue' is quite drought-tolerant, even in a pot with a limited amount of soil. Mine gets drip-irrigated once a week (plus some occasional gray water from the kitchen when I happen think of it), and it seems perfectly content with that regimen. 5. With regular pruning, I think I can keep it small enough so it doesn't look disproproportionate for its container. Jacaranda ‘Bonsai Blue’ marketed by Monrovia is a true dwarf developed by Kiyoshi Sakai in Japan. 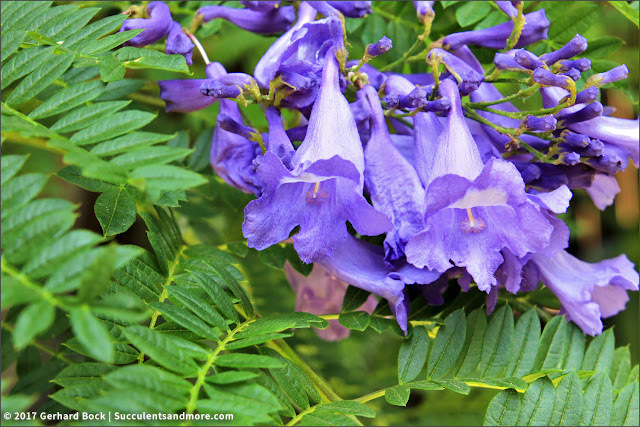 It tops out at 6 ft. in height by 5 ft. in width, as compared to a height of 40+ ft. for a regular Jacaranda mimosifolia. Cold tolerance is the same at 25°F (zone 9b). The first 800 specimens sold by Monrovia were contract-grown in Israel by Hochberg Export Ornamental Plants. Availability is still limited, but hopefully it will be sold in more nurseries (and at a lower price) in the years to come. I have a standard seed-grown jacaranda growing in the ground here in Redding and I am surprised at how well it has handled heat, cold, and drought. And in full bloom it is the finest of trees. In Redding! That's even more impressive, considering it typically gets a few degrees colder in the winter than we do in Davis. 2: They drop most of their leaves even here, so that's normal. I think they are described as "semi evergreen" in the Sunset WGB. Pruning, they sprout pretty readily from bare wood. Skillful shaping when young creates the best trees long term. My neighbor in the back never trained his and they are awkward. I saw some for sale a month or so ago, and was tempted...the regular ones are all in bloom here now, better than in several years because of the rain we got. Beautiful, but so far I am content to enjoy the neighbor's, one in back of us, one in front of us. The dwarf version is the most tempting. Good to know that they sprout from bare wood. That'll give me confidence to be less timid about pruning. I just saw a jacaranda in full bloom in Sacramento last weekend. Such a beautiful sight. I wish I had room for a full-size specimen, but 'Bonsai Blue' is almost as good. Glad to see it doing well and the blooms are very striking blue. Mind you it is definitely well worth growing for the foliage alone. It's a beauty and one more reason to admire (be a little envious) all of the cool plants you can grow in your climate! Funny, I feel that way quite often when I read your blog! I'd wondered how yours was doing too. Even though the price here hadn't come down, I caved and bought my own 'Bonsai Blue' in December. It'd already been pruned by the nursery at that point. When I posted on my first flowers weeks ago my tree stood only about 2 feet tall but, with the recent flush of new foliage, it's put on several inches. My plant didn't lose all or even most of its leaves but I've noticed that the older leaves took on a sickly orangish-yellow cast before being replaced with new growth. I've noticed the same with the full-sized specimens in my own neighborhood. Your 'Bonsai Blue' is so cute (link to Kris' blog: https://krispgarden.blogspot.com/2017/05/may-favorites-2017.html). I bet it'll be 5 ft next May or even taller, especially since it's in the ground where the roots can run. I think that the leaves are replaced every year, which is why you saw all those yellowish leaves. 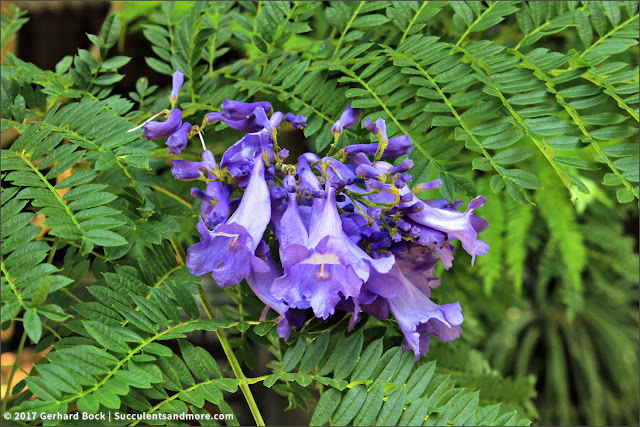 Just returned from LA and the jacarandas were in bloom everywhere! Have always wanted one, but no room for another big tree! So, thanks so much for your piece today. I've phoned around in the East Bay and found two nurseries that have them in stock, for between $100-125 for 5 gallons. So, I'm wondering how big your pot is? I have a Talavera one that is about 17" diameter and 15" high. Do you think that would be big enough? Also, do you think it would be a good idea to include an olla in the pot for watering? Thanks so much for your help! I think I paid $95 at Orchard Nursery in Lafayette. I bet they have some in stock. My pot is a bit bigger than yours but if you kept it pruned, I think you'd be able to grow it in the talavera pot you mentioned. Yes, Orchard has them for $100; I'll ask them about the olla idea. Btw, I visited Civano on my way back from Santa Fe last month and saw that there were a number of properties on the market -- so charming! Nice little nursery too!